On my recent Christmas vacation, I had had a short layover at Chicago O'Hare International airport. This airport was huge with 2 buildings connected by a under pass. The picture above is what the underpass looked like. The rainbow neon light on the ceiling would light up in sync with the music playing in the background. The curved side walls also change color too. Let's just say I was impressed by this underpass. The rest of the airport was okay, nothing extraordinary, except their fully automatic toilet seat cover. However they already had this when I was here back in 2001, so I wasn't impressed this time. If you want to see what the hype is about, click here. Anyways back to what I am intended to blog about: Eli's Cheesecake. Since our layover was very short, we just grabbed some Mc.D for lunch, but right across from Mc.D there was this stand that caught my eyes. It said "Voted Best Dessert in Chicago". Cheesecake is my favorite dessert of all time, and with a claim like that, I couldn't pass it up. The were quite a selection for such a small stand. I based my decision on 2 factors. One, I didn't want any other flavors/distraction to mask the taste of their cheesecake, such as strawberry toppings or cookie bottoms. Two, I had to board soon, so I had to make a decision quick, therefore I went with their original. One slice of the original was priced at $3.79 + tax, which is considered cheap, but it was a pretty small slice. 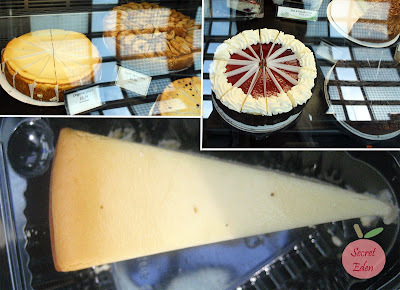 So how was 'Chicago best cheesecake'? It was soft and smooth with a strong cheese flavor and just the right amount of sweetness. In a nutshell, it was delicious. However the only reason it received a 4 is because I still prefer the ones at Cheesecake factory, because Eli's cheesecake is more dense in comparison. In the end, I wish I bought more than one slice. It's too bad we were in such a rush, because I actually ate the cheesecake after we boarded the plane, so there was no way of going back to get more. Fortunately, if you want to try Eli's cheesecake, you can order them online (Click here), but they only ship to US. Also, it's not cheap, most whole cheesecake is over $30USD plus a hefty shipping charge (but they do pack on dry ice). However they are cheaper than Cheesecake factory. So the question is; how much are you willing to pay for the dessert you love ;) ? 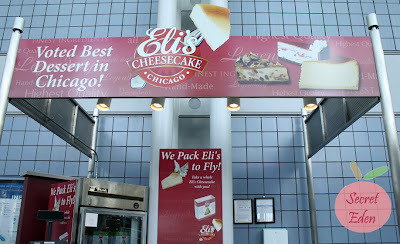 Thanks so much for visiting the Eli's Kiosk at O'Hare. Our Bakery and Cafe, Eli's Cheesecake World,with the biggest selection of Eli's anywhere, is just 10 minutes east of O'Hare so allow more time on your next visit. We look forward to you sampling more Eli's!